WIth 2.9 solidly behind us and one of the most feature rich releases ever, we are really pumped to keep up the momentum and brining you more great things! Several of [i]us[/i] (active developers) spent some time last week to map out what we want to try and accomplish in the next release, when it should come out, and tackle the hard problem of what we will need to move out of the 2.10 wish list so that we can get a release out before the end of 2012! Since it’s really important for us to bounce off such plans on all of you, I wanted to share a summary of what is on our mind. Because the last release cycle was just shy of a year and incorporated some substantial architectural changes, we thought we would take a bit of a breather and shoot for a target date of Astricon 2011 for our next cycle, which means right around Nov 1. Since 2.9 has been out for about a month, this means we have about a 6 month cycle, or 5 months from now. That will gauge what we can and can’t get in. [list] [*] Call Recording functionality. This is the one [i]”big ticket item”[/i] that we want to try and tackle in this next release. For those long timers who care about call recording, you are probably aware of the limitations and issues with getting calls recorded. Our plan is to revisit the call recordings ability system wide and try to come up with an overall call recording capability that deals with policy constraints such as call recording between extensions if one allows and one doesn’t, etc. More to come on what we have in mind once we sit down and really start to design this out. [*] [url=/forum/freepbx/general-help/rfc-backup-restore-renovations]Backup Module. [/url] Schmooze has stepped up to the plate and is planning on doing a rewrite of this module that has been long plagued with various challenges. Although this module often works fine for many, there continues to be a background ‘buzz’ of various issues that continue to be encountered and no one likes to find out that their backups failed at the time of restoring. Add your thoughts/comments/feature requests to [url=/forum/freepbx/general-help/rfc-backup-restore-renovations]this thread[/url]! [*] IVR Module. Schmooze has also stepped up to the plate with a plan to rewrite this module. Details of what this means for features will be forth coming, but many of the changes are more internal coding changes that will facilitate our ability for other modules to “hook” into this. (This allows new functionality to be introduced, for example, a speech recognition module that could add the ability to speech enable an IVR). [*] New Features. This is always the one we have a lot of fun with and where we can best engage the community! We have yet to dig through the hundreds of tickets or hear your feedback to blogs like this one in determining what we can squeeze into this release so that will all be forth coming. There are lots of ideas and I’m sure plenty of you will take this opportunity to add more! We will do our best to listen to all the input, read through all the tickets, and see what we can realistically get into the release given the time schedule and other “big” changes we are working towards! For now though, feel free to toss out your ideas! Outside of these major points, there are other decisions we have made going forward. Here is a summary and there will be more to come on some of these. [list] [*] Asterisk release support: This topic is always sensitive and there has been a lot of discussion about this for quite some time. The challenge we always face is how far back to support an Asterisk release, in conjunction with their own support life commitments, and at the same time try to innovate and come out with new features and capabilities. In the timeframe of this release, 1.8 will have been out for a year and its stability is anticipated to be quite solid (it’s already looking pretty good now). Asterisk 1.10 will be coming out at the same time and as always we want to support the newest release. Both 1.4 and 1.6.x have already had their [i]end of life[/i] announced and by the time 2.10 is really mature, will no longer be supported by the Asterisk team. Given all that, we’ve decided to take the approach for 2.10 that we will focus on 1.8 and 1.10 support. This does NOT mean that it will not support 1.4 and 1.6, it means that we won’t go out of our way to support those and it’s unknown until we get a bit further down the road if there will be support issues for these releases. We will evaluate the situation further down the road and if it turns out that these release will be affected, we will make sure that 2.9 has a long enough support life to cover the requirements of those in the community who need to stay on older Asterisk releases, even to the extent that the Asterisk team is no longer supporting these. [*] PHP Support: We will no longer support PHP4, which should not be an issue as PHP4 has been obsoleted now for multiple years and the measurable FreePBX population still on PHP4 is almost insignificant. We will be coding against PHP 5.3 and even though current releases of popular Linux distributions are not yet on 5.3, FreePBX already comes with a compatibility library that includes the missing pieces such that these will all be fine. [*] A few things we will be deferring because of the release schedule is a rewrite of the User Portal (ARI) and the replacement of the current CDR Reports. However, due to the Call Recordings re-architecting mentioned above, the ARI will be maintained so as to tie into those changes. [*] FOP: This one is a challenge we have been wrestling with for quite some time. The current FOP is not being maintained given the FOP2 that asternic has had out for quite some time. FOP2 is an excellent product and will be available in our Market Place, but the free version is quite lacking in its inability to have any control as to what gets displayed in the 15 free icons, thus making it very difficult to evaluate if it’s worth the purchase. (For you big sites, that’s not really an issue, but for all the small guys and hobbyists out there, it matters a bit more.) However, as it stands FOP does not really work and is plagued with issues which are not being addressed and we feel our hands are a bit forced in that it probably needs to be removed. That means outside of FOP2 (free and commercial) and the iSymphony solutions that will also be available in the marketplace, we are left without a good “free” replacement for FOP. We are happy to hear your thoughts and ideas around this as we really feel it’s something that is not in our control. Well, there’s a pretty good overview of what is going on and where our collective thoughts are at. We really look forward to hearing from you as we continue to move forward on this and will make sure to keep you up to date and incorporate your feedback into our planning process! 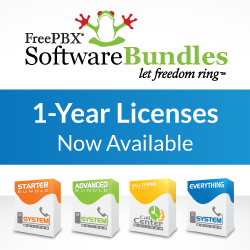 [b]Philippe[/b] – On behalf of the FreePBX Team!